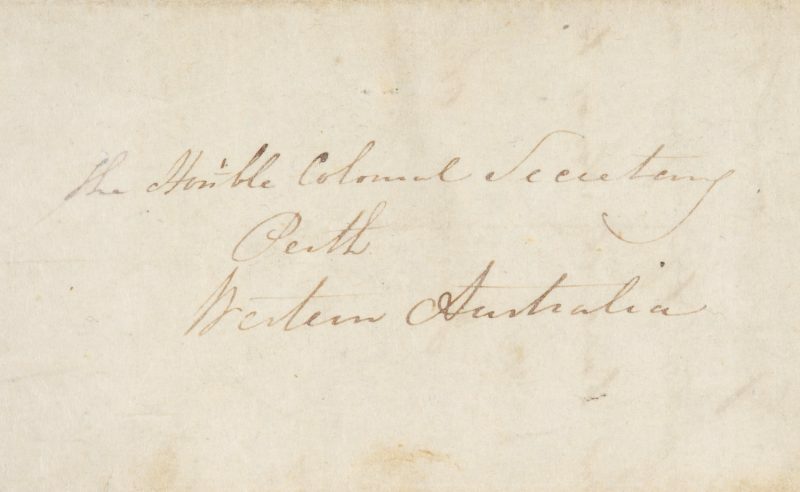 Manuscript letter addressed to ‘The Hon’ble Colonial Secretary, Perth, Western Australia’ [Peter Nicholas Broun], headed ‘Cockermouth, Cumberland, 4 January 1842′, written by the as yet unidentified husband of one of Theophilus Ellis’ nieces. 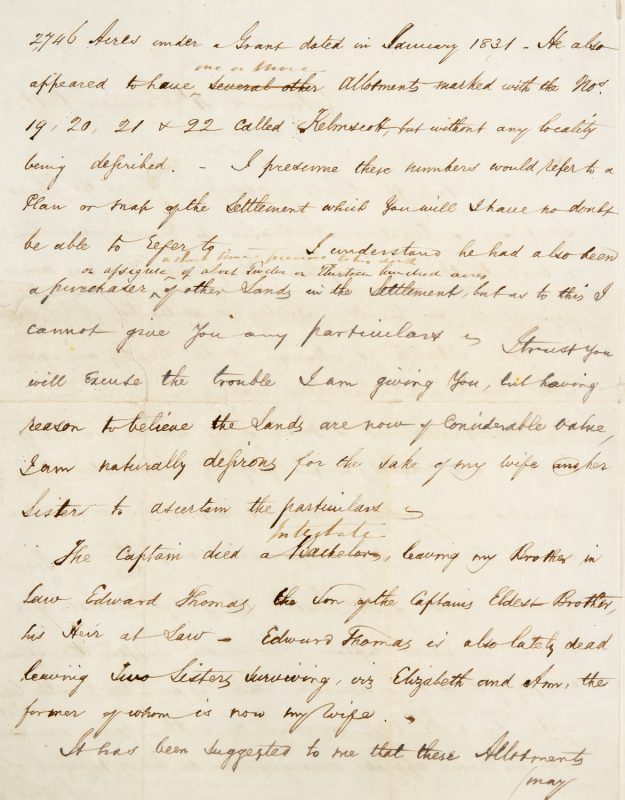 Single sheet, 265 x 410 mm, bifolium, written in ink on  pages, the fourth used for the address; the letter is not signed and without postal markings, so is a copy kept by the sender; the first page has an old tear expertly repaired and is protected with conservator’s tissue; otherwise the letter is complete, clean and legible. The subject of this apparently unrecorded letter is Dublin-born Theophilus Tighe Ellis (1782-1834), one of the most notable early settlers in the Swan River Colony. 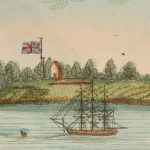 A retired Captain of the 14th Regiment, he arrived in Western Australia in 1830. Ellis selected land in the Avon district and was appointed Resident Magistrate at Kelmscott. 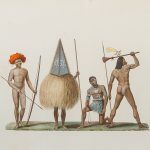 In December 1831 he offered to form a Volunteer Cavalry Guard to protect the settlers from Aborigines, and in 1833 was appointed Superintendent of Native Tribes. 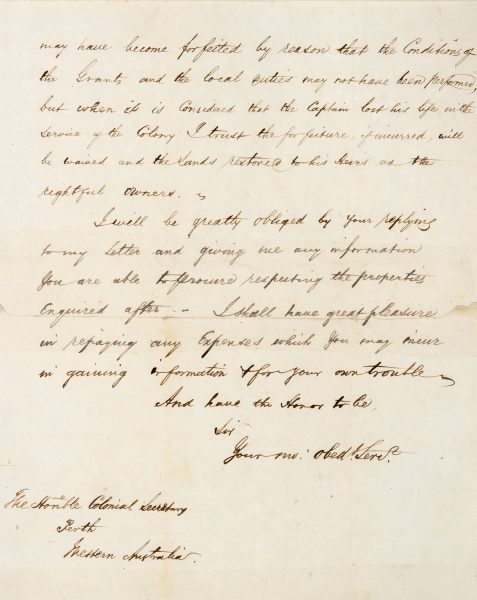 In July 1834 he was made Principal Superintendent of a troop of Mounted Police. 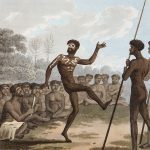 Ellis died from wounds received at the Pinjarra Massacre (also known as the Battle of Pinjarra), an attack against 80 Noongar people made by 25 soldiers, police and settlers led by Governor Stirling on 28 October 1834. 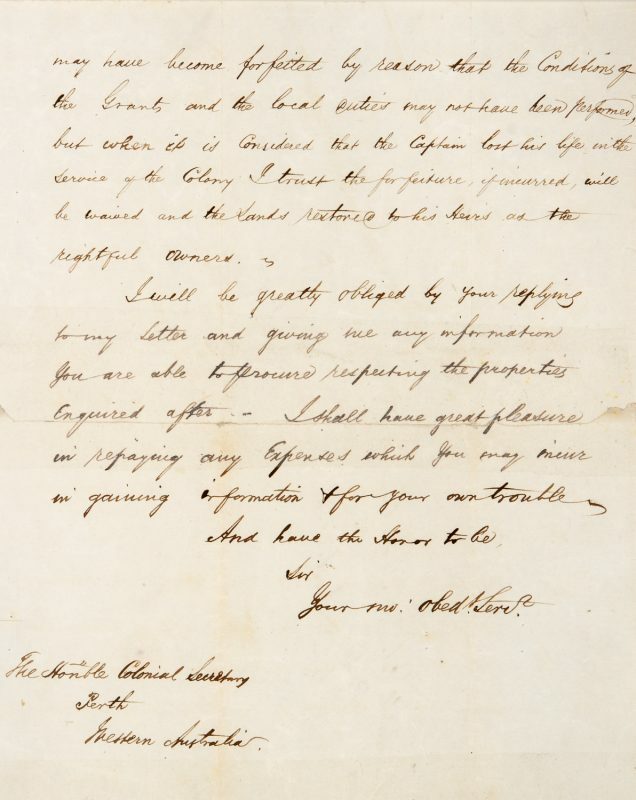 The author of the letter was married to Ellis’ niece, Elizabeth (sister of Edward Thomas Ellis, the only son of Theophilus’ brother Francis Edward Ellis). 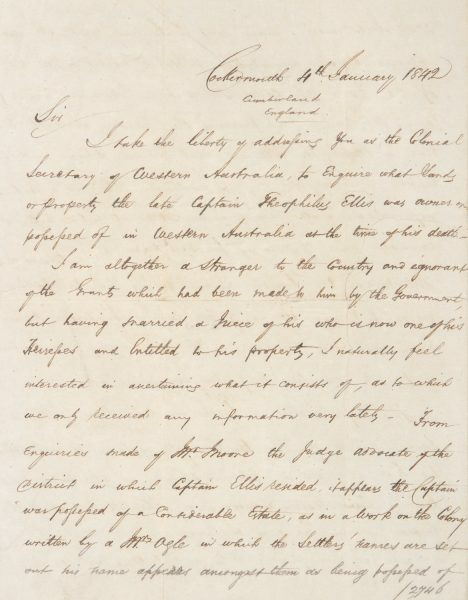 He makes an enquiry addressed to Broun, the Colonial Secretary in Perth, regarding his wife’s right of inheritance over Theophilus Ellis’ Swan River properties. 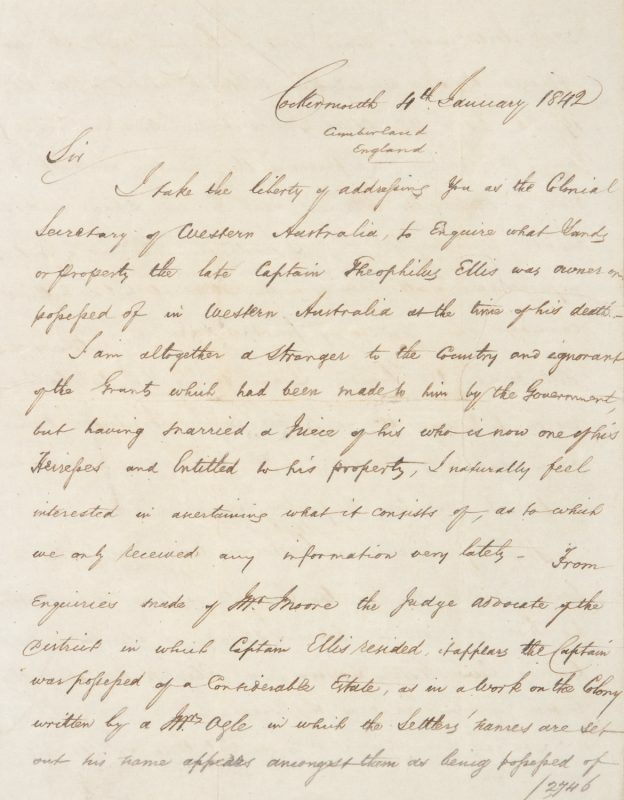 I take the liberty of addressing You as the Colonial Secretary of Western Australia, to Enquire what Lands or Property the late Captain Theophilus Ellis was owner or possessed of in Western Australia at the time of his death. The Captain died intestate, leaving my Brother in Law Edward Thomas, the Son of the Captain’s Eldest Brother [i.e. 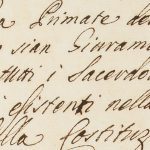 Francis Edward], his Heir at Law. Edward Thomas is also lately dead, leaving Two Sisters surviving, viz Elizabeth and Ann, the former of whom is now my wife. 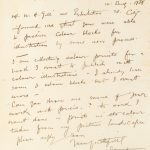 Frustratingly, we cannot find the genealogical records for Edward Thomas Ellis’ two sisters, Elizabeth and Ann, which would lead to the identification of the author of the present letter.